Edison, NJ. – The AC Drive group of Fuji Electric Corp. of America is pleased to introduce the “FRENIC-HPAQ” package drive solution to their product portfolio. Available in 3 different configurations, the HPAQ package drive solution offers a complete bypass solution for both Fan & Pump applications as well as a non-bypass solution. 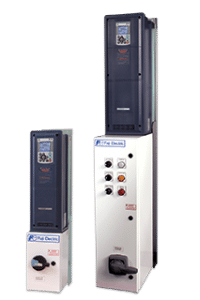 Utilizing the slim type FRENIC-HVAC series inverters, the HPAQ series delivers a narrow form factor design to minimize space usage, while providing powerful performance with many embedded Fan & Pump Macros. Available in multiple configurations such as, Combination VFD with Disconnect and 3 Contactor Bypass designs with specific functionality for pumps or cooling tower/ventilation fans. The new space saving designed FRENIC-HPAQ series offers flexibility for your application. Fuji Electric General Manager, Drives and HMI Depts. Fuji Electric Corp. of America is a wholly owned subsidiary of Fuji Electric Co., Ltd., and has been responsible for sales and distribution of the company’s products since 1970. Fuji Electric Co., Ltd. began developing power electronics equipment in 1923, and is a global leader in industrial products ranging from semiconductors, HMIs, power supply, and power generation equipment to AC drives and uninterruptible power supply systems. For more information please visit www.americas.fujielectric.com or follow us on Twitter @FujiElectricFEA.